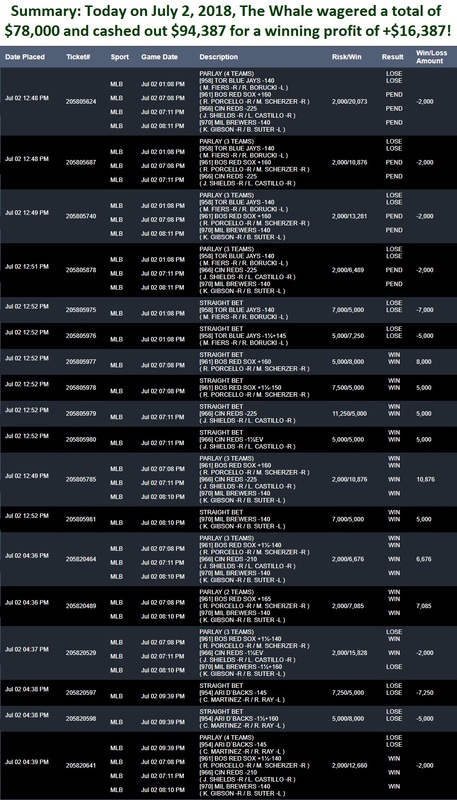 Add it up: That’s 4 consecutive winning days and a total of $71,767.09 in profits, turning $78K into $150K. My mission is to run this up to over a million dollars this month. Since the start of the 2018 MLB season, I’m currently up a total of $119,730.01. I’m in the midst of what could be the very beginning of the next monster winning streak. Last month, I went on a 21-day winning run that saw me took $26,000 and turned it into more than $326,000. This month, my goal is to make over a million dollars off the current winning streak. Today, I plan to bet over $100,000 on my picks as I accelerate on my mission to show you a winning streak of a million dollars. I’ll show you all the tickets and results as they come in. 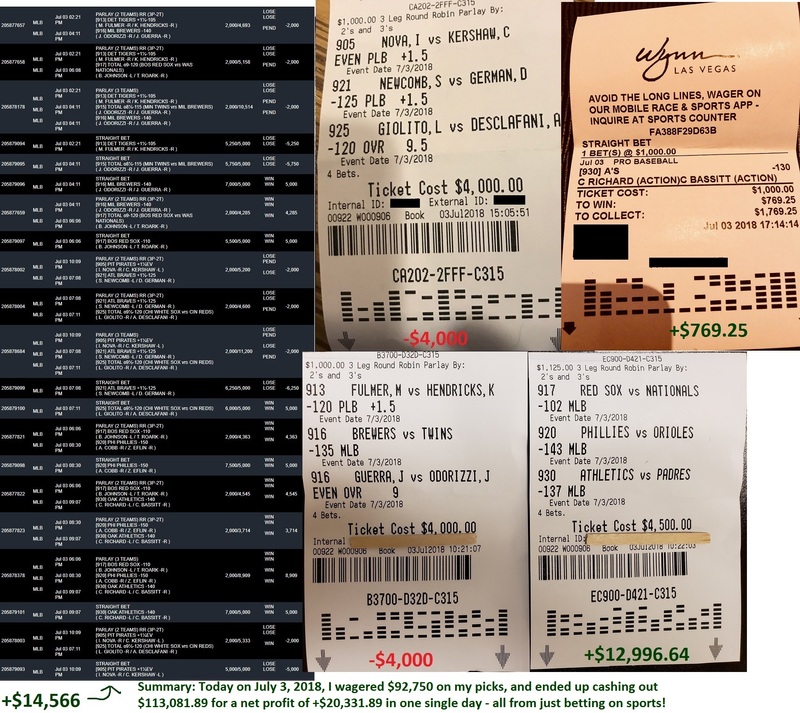 At the start of this week on Monday July 2nd: I wagered a total of $78,000 and ended up cashing out $94,387 for winning profit of $16,387. 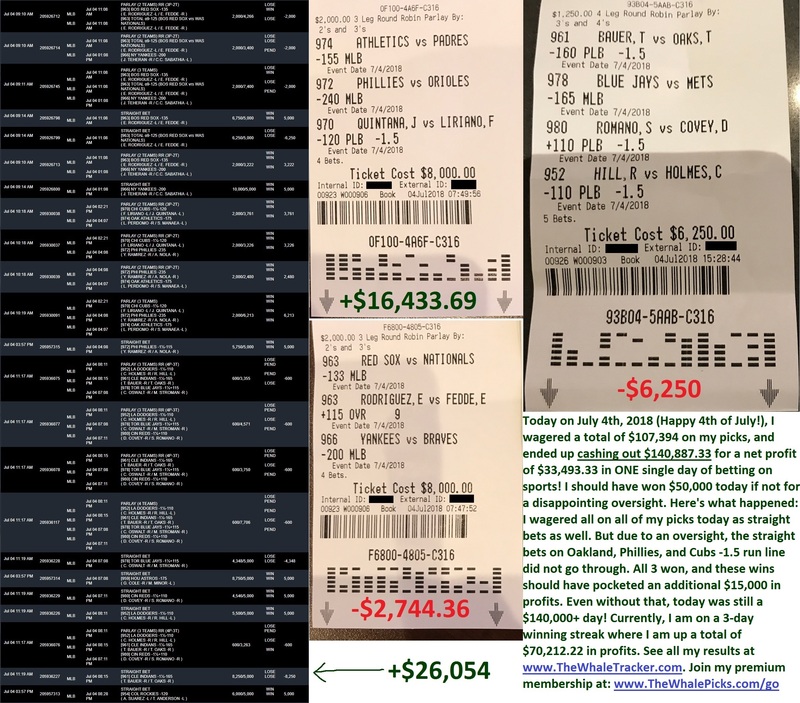 The next day on Tuesday July 3rd: I accelerated and wagered $92,750 on my picks, and ended up getting paid out $113,081.89 by the day’s end for a winning profit of $20,331.89. So in just 2 days, you saw me take $78,000 and turned that into $114,718.89. On Day 3: I accelerated again, betting a total of $107,394 on my picks, and ended up cashing out $140,887.33. That’s a winning profit of $33,493.33 in one day. 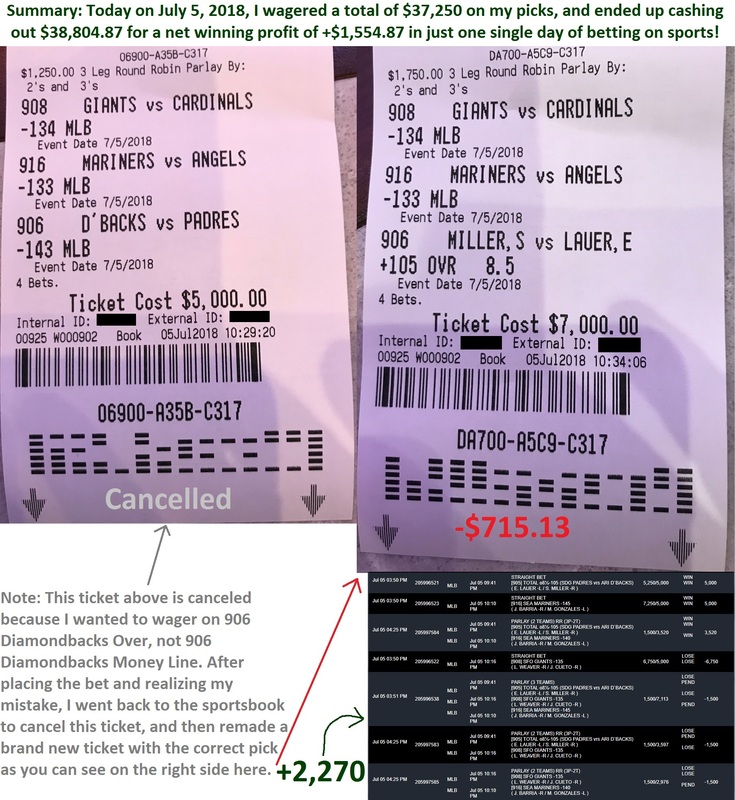 Yesterday on Day 4: I wagered $37,250 on just 3 picks in a combination of a round robin and straight bets, and cashed out $38,804.87 for a net winnings of $1,554.87. Do the math: On Day 1 I profited $16,387. On Day 2 I profited $20,331.89. On Day 3 I profited $33,493.33. On Day 4 I profited $1,554.87. That’s a net total profit of $71,767.09 in just the last 4 days of betting on sports. I started with $78,000 in my hands on Monday, and by Thursday, I had already turned that into nearly $150,000! My next goal is to show you a million-dollar winning streak. If all goes well, you could see me win a million dollars in the coming weeks. Stay tuned, I can’t wait to show it all to you as it happens. Remember: The best time to Tail The Whale is when I’m hot. Right now, I look primed to go on my next big winning streak. The patterns look like they are aligning right now, and these are the times when I can go on my big streaks. In just the last 4 days, I have now won a total of nearly $72K. Not a bad start to what could become a monster run. All the signs are strongly showing right now that this could very well be the start of my next monster winning streak. Last month, I took just $26,000 on my hands and turned it into $326,000 just 3 weeks later, and you saw it happened with your own eyes. This month, my goal is to show you how I can run this up to over a million dollars. Join hands now with me, and you can start tailing one of the most successful sports bettors, ever. Today, I will ramp up my action once again. Expect me to bet $100,000+ today on my picks as I accelerate on my mission to show you how it’s possible to win millions from betting on sports. Want to follow along and bet on the same picks that I’m taking myself each day? I’ve won tens of millions of dollars from betting on sports over the years. Now, you can follow me and take on the same picks I’m taking through the premium Whale Picks membership. Click here to lock in your VIP access to The Whale Picks.